Onward to what lies ahead. The days were steadily growing shorter. The sun now traveled more quickly across the sky than it had a few weeks previously, though the nights still were heavy with the heat of summer. There were only a few more hours of daylight left, and the heat radiated off Baer's thick coat. 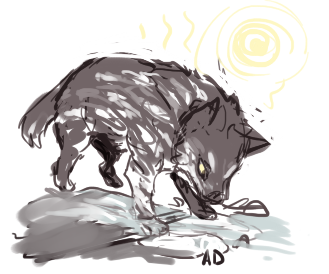 He wasn't built for heat; even his summer coat was densely furred for the cooler climates of higher elevations. A low growl of irritation rumbled deep in his throat as his shook his fur, ridding himself of some of the accumulated heat. Perhaps he should have waited a few more months before setting off from his homeland, winter would have been a much more comfortable travel even if the game was less consistent. Unfortunately, his travel had been determined by more pressing matters than just comfort. Baer shook his head to clear his thoughts; it was best not to dwell on what he could not change. He need only think on the present. Presently, the sound of water lapping against stones drew his attention. A thin stream was all that remained of what must have been a thriving river in winter, now reduced to a trickle in the summer heat. Baer stepped into the water, sighing at the coolness against his worn pawpads. A thought came to him, and he tasted the air to make sure he was alone. Awkwardly, he folded his legs beneath him and shifted about until his entire body was sprawled in the small stream. He let his eyes close as he relaxed, feeling the chill fingers of the water soak through his heavy fur and steal the heat from his skin. His thoughts wandered, though he steered them from the past, focusing them toward sorting out his future. Where was he going now? He'd been traveling for days in the direction of some sort of “Paradise”, though he had doubts that such a place actually existed. The world was full of strife and chaos, and he didn't know exactly where this Paradise was, only getting this far on the words of rumors and tales. They would get him a little farther too. With his thoughts focused on the future, he opened pale yellow eyes, and did not look back. Other: Though distinct with his mottled coat of deep wood browns and grays, the markings allow him to disappear in thick foliage despite his large size. He tends to hold back speaking until sure of what he means to say, which often results in only speaking an occasional word, if at all.